The 27-year-old's present deal expires in 2019, although United have an option to extend it by a further season. The Old Trafford club were keen to begin talks with goalkeeper De Gea's representatives and their hand has been strengthened by Thibaut Courtois' £35m move to Real Madrid from Chelsea. Real have repeatedly been linked with Spain international De Gea since 2015. The Bernabeu club came within minutes of signing De Gea, only for a broken fax machine to prevent the required paperwork from being sent. 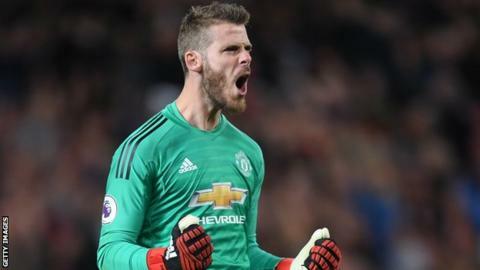 In May, De Gea, who joined United from Atletico Madrid in 2011 in an £18.9m deal, was named the club's player of the year for an unprecedented fourth time. He was also included in the Professional Footballers' Association team of the year after an impressive season at Premier League runners-up United. However, De Gea was not as convincing for Spain at the 2018 World Cup in Russia and he came in for criticism after making an error which allowed Cristiano Ronaldo to score for Portugal in a 3-3 draw in their first game of the tournament. He was back in action for United in the first game of the 2018-19 Premier League season against Leicester City and made two key saves in helping his side win 2-1.